Pom-poms have a number of uses from completing cheer leader costumes, for school plays, for cheering on your favorite sports team, for home coming, or just for play time for kids. 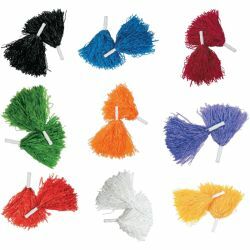 Our pom-poms have a white handle with rigged grips and plastic white pom-pom streamers and comes in pairs. Available in a wide range of colors. Pom-Poms has a 4" handle and 10" poms.